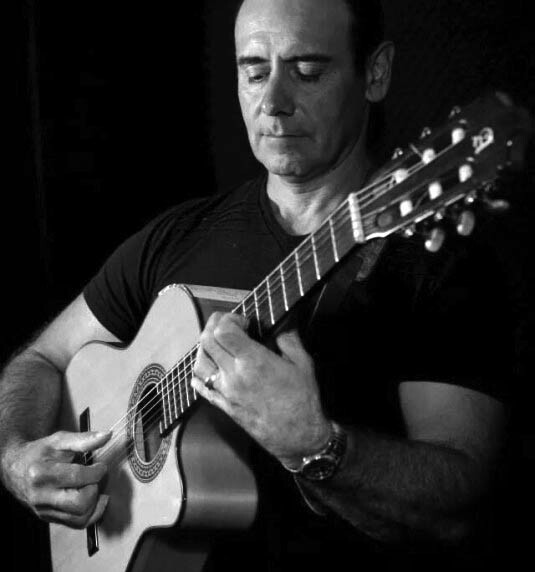 Carlos Alberto Calabrese, guitarist, singer, and songwriter, was born in the beautiful city of Buenos Aires, Argentina, and began playing the guitar after receiving the instrument as a gift from his parents on his 11th birthday. Although he has spent most of his life in the United States, Carlos has never forgotten his musical roots. Throughout the years he has played almost every style of music before settling on his true love, the Spanish guitar. Carlos has performed extensively throughout the country, displaying a strong Latin influence reminiscent of his Argentine heritage. His unique blend of Flamenco, Jazz and Brazilian sound has entertained thousands of people at concerts, private events, restaurants, and coffee houses, and on local and national radio and television. Carlos’s musical influences include Jose Feliciano, Ottmar Liebert, and the Gipsy Kings, to name just a few. Carlos has won the hearts of many fans with his romantic, Latin inspired ballads. His technical prowess and heartfelt lyrics are something to be seen and heard. He is a true musician’s musician. Carlos became interested in a form of flamenco while growing up in Argentina. Carlos’s great-uncles were skilled players of Argentine folk guitar, which is closely related to the flamenco genre. His uncles lived on a working ranch open to the public, and wore the traditional “gaucho” attire when performing their music for patrons. Carlos was intrigued by his uncles’ technique of strumming a nylon string guitar solely with the use of fingers, but it was not until seeing Jose Feliciano perform on television that he became truly fascinated. As an adult, Carlos was inspired to study and perfect his style before finally introducing it to the public. “One never completely masters this music,” says Carlos, always striving to learn more and more.